San Francisco 49er Anquan Boldin catches a touchdown pass in front of the Seattle Seahawks’ Earl Thomas. San Francisco 49ers’ Anquan Boldin catches a touchdown pass in front of Seattle Seahawks’ Earl Thomas (29) during the second half of the NFL football NFC Championship game Sunday, Jan. 19, 2014, in Seattle. Editor’s Note: FiveThirtyEight is running a series of eight NFL previews, one division at a time, to highlight the numbers that may influence each team’s season. America’s favorite weekly soap opera is about to begin; get prepped. Over the last three seasons, Seattle running back Marshawn Lynch was the only player to record at least 900 carries in the regular season, and was one of just two players to rush for more than 4,000 yards since 2011. While those stats are gaudy, to some they’re also a potential sign of overuse. There’s a line of thinking among NFL-watchers that running backs only have so many yards in them before they exhaust their skill. 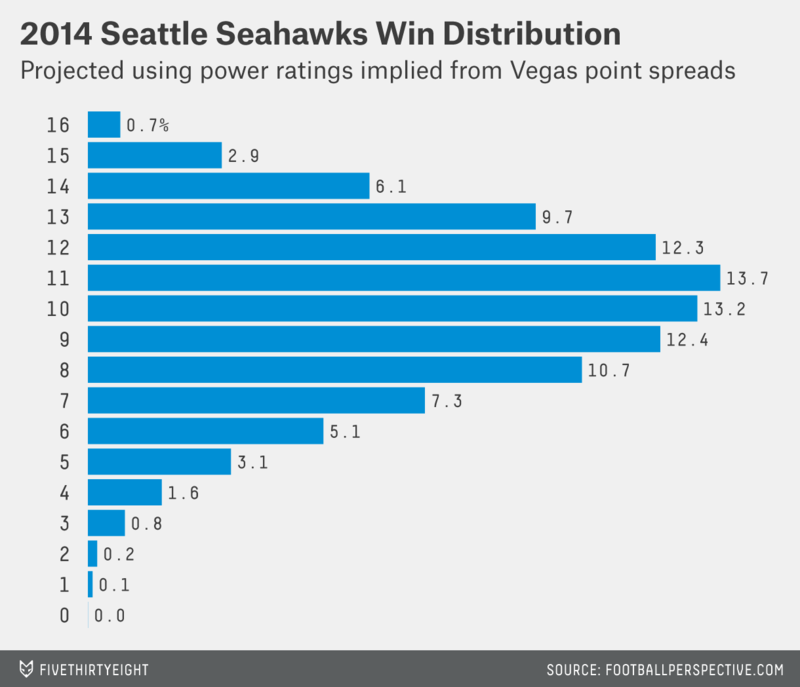 But Seahawks fans (and management) shouldn’t be concerned about Lynch’s heavy workload. Proving the connection between “high number of carries” and “sharp decline in ability” has never been easy, in large part because the running backs who earn the most carries tend to be among the most talented. 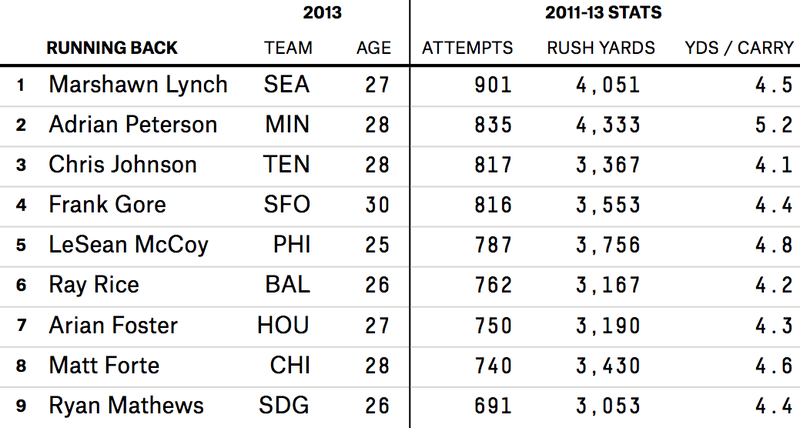 Moreover, Lynch’s workload isn’t that high. While his 901 carries over the last three years is the most in the NFL, it’s also the fewest number of carries the leader in this statistic has had in any three-year period since 1989-1991, when Barry Sanders recorded 877 carries. Seattle fans may have flashbacks to running back Shaun Alexander, whose career crashed shortly after leading the team to the Super Bowl in 2005, but Alexander recorded 1,049 carries from 2003 to 2005. From 1970 to 2013, there were 43 players who had between 850 and 950 carries in a three-year period, and who were 26 to 28 years old in the final year of that span. On average, those players (excluding Lynch) rushed 300 times per season and averaged 4.3 yards per carry during those three years. And, on average, those players played in 12.6 games the following season, rushed 224 times and averaged 4.2 yards per carry. To test whether that drop-off is due to a heavy workload, we need to measure against a control group. To do that, I looked at all running backs since 1970 who recorded between 600 and 800 carries1 over a three-year period, averaged between 4.1 and 4.5 yards per carry,2 and were 26, 27 or 28 years old at the end of the three years. There were 44 such players,3 and on average they rushed 237 times per season over those three years and averaged 4.3 yards per carry. The following season, that group averaged 206 carries and 4.1 yards per carry. In other words, the control group rushed for fewer yards and averaged fewer yards per carry than the “high-workload” backs. The real worry about Lynch should be his age. Older running backs are much more likely to decline than younger running backs, and nearly every running back in his late 20s is on the wrong side of the age curve. The 49ers were the second-oldest team in the league last year, after weighting each player by how important he was to the team (as I did, using Pro-Football-Reference.com’s Approximate Value system). The average AV-adjusted age of last season’s 49ers as of Sept. 1, 2013, was 28.2 years. 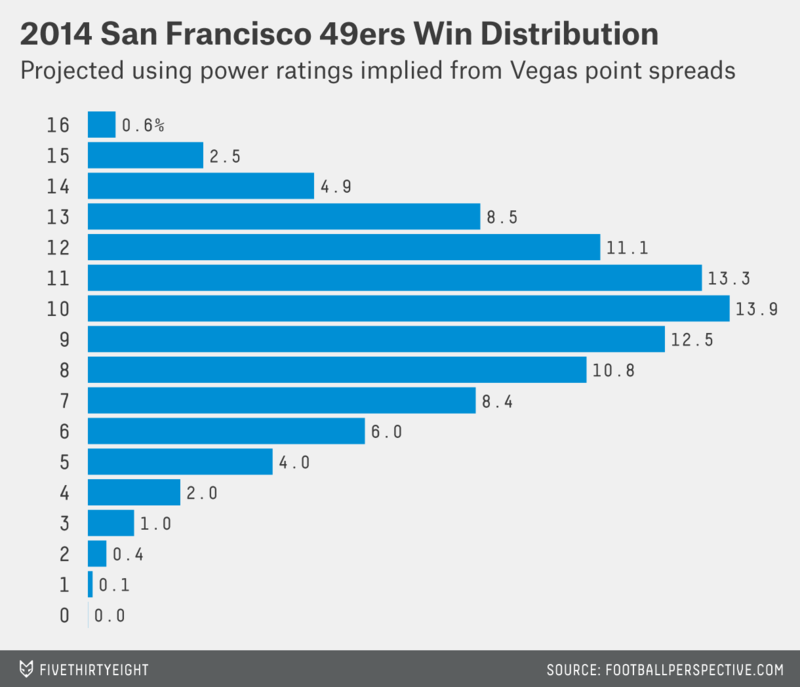 That may make San Francisco more vulnerable to a regression to the mean in 2014. I calculated the AV-adjusted ages for the 138 teams from 1990 to 2012 that won 11 to 13 games in a season. (The 49ers won 12 last year.) I then measured how many wins those teams had the following year. Age appears to be a factor, but only at the extremes. I grouped the teams into four buckets based solely on age. For example, the oldest quarter of teams in this study had an average age of 28.9 in the first year and won 12.0 games; the following year, those teams dropped to an average of 8.6 wins. The youngest quarter of teams regressed the least, which isn’t surprising. But the evidence here suggests that being just a bit older than average isn’t any worse for a team than being average or slightly younger than average. The teams in the middle quartiles — like the 49ers — are not nearly as sensitive to age effects as the teams on the extremes. This is good news for 49ers fans, but the performance of the defense’s top players remains uncertain. Inside linebacker NaVorro Bowman was a first-team All-Pro choice last year, but tore his ACL and MCL in January and will miss much of the 2014 season. Outside linebacker Aldon Smith is the team’s main pass-rusher — he has 42 sacks over the last three years, 20 more than the next-best 49er — but he will likely be suspended for at least part of the season. Defensive end Justin Smith, who has compiled the second-most AV on the team over the last three years, turns 35 in September. Even linebacker Patrick Willis, perhaps the team’s best player, will be 30 by the time Super Bowl XLIX comes around. The window isn’t closed on the 49ers, but the defense’s best days are already behind it. The Cardinals won 10 games last year, only the second time the team reached double digits in victories since moving to Arizona in 1988. Their run defense was the key. 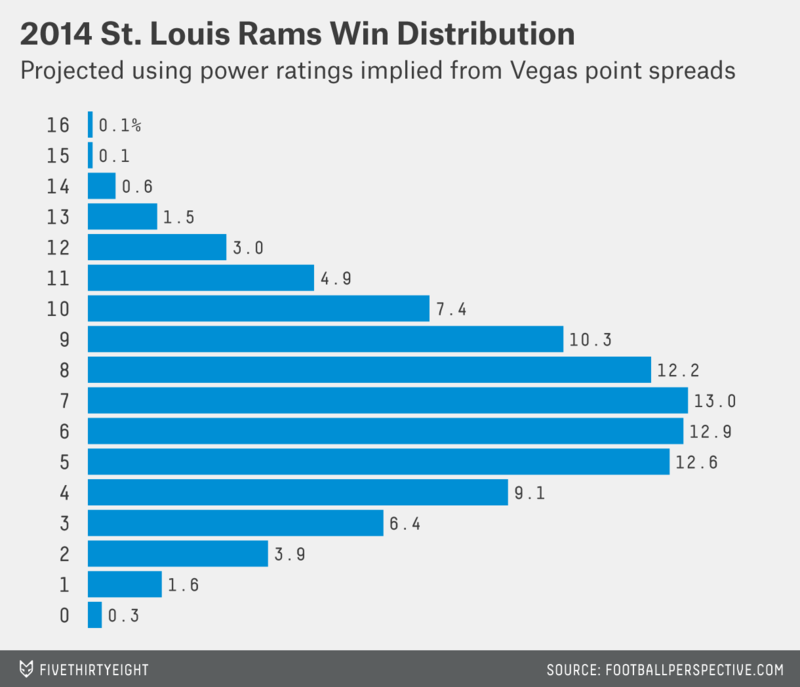 The Cardinals allowed just 1,351 rushing yards, the fewest in the NFL. They ranked first in rushing defense DVOA, Football Outsiders’ main defensive statistic, and stuffed opposing ball-carriers for no gain or a loss on 28 percent of runs, the most in the NFL. But three of the key players responsible for that success are gone, including inside linebacker Karlos Dansby. Dansby was one of just two players in 2013 to record 100 tackles, more than four sacks, and more than four interceptions. He is a very good run defender, but he is also a strong pass-rusher and is excellent in pass coverage. Of course, that’s why the Cleveland Browns signed him to a four-year, $24 million deal on the first day of free agency. The Cardinals were prepared for Dansby’s departure, but the other two exits left the team with little time to find a solution. In June, starting inside linebacker Daryl Washington was suspended for the season for (again) violating the league’s substance abuse policy. Like Dansby, Washington is a versatile player: He’s a great pass-rusher (his nine sacks in 2012 were the most by an inside linebacker since Bart Scott’s 9.5 in 2006) and above-average in coverage, in addition to being a strong run-defender. And last Monday, defensive end Darnell Dockett was lost for the season after tearing the ACL in his right knee. Dockett is not just an above-average 3-4 defensive end against the run, but a team leader and — along with superstar wide receiver Larry Fitzgerald — the player on the team with the longest tenure. Replacing Dansby and Washington are a pair of players on opposite ends of their career arcs. Kevin Minter was the Cardinals’ second-round pick a year ago, but played just one defensive snap as a rookie. Ex-Steeler Larry Foote, 34, has started just 22 games over the past four seasons. 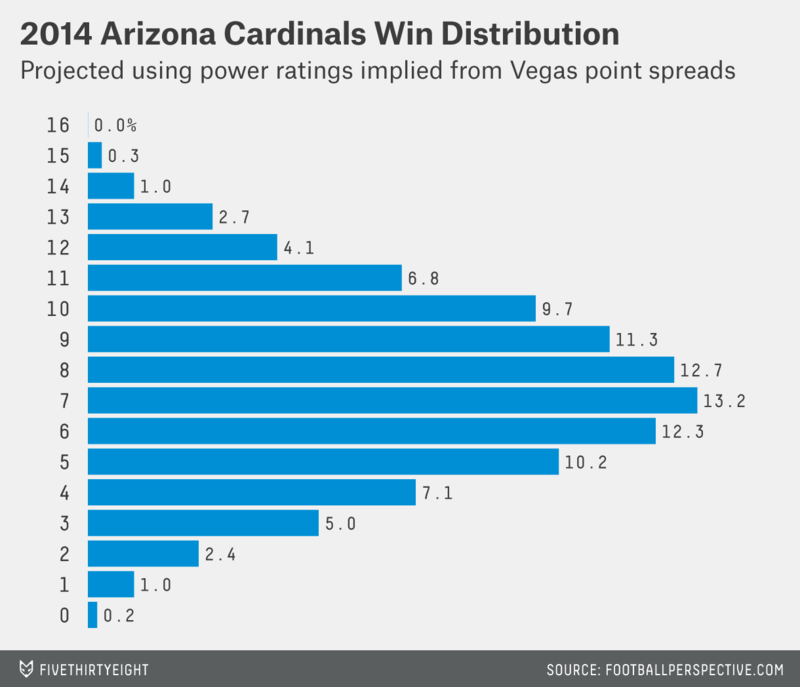 The Cardinals, so used to relying on their run defense, now don’t know quite what to expect from it. The Rams emerged as a trendy breakout pick this offseason because their young players were supposed to have finally matured. Last year, the Rams had the third-youngest offense and the youngest defense in the NFL, according to AV-adjusted team age. Rarely has a team fielded so many highly drafted players along both lines. All four of the team’s projected starting defensive linemen were selected in the first 14 picks of the NFL draft, which would be a league first; the offensive line features Jake Long (the first overall pick in 2008), Greg Robinson (the second overall selection this year) and Rodger Saffold (selected 33rd overall in 2010). The starting wide receivers (Tavon Austin, Brian Quick and Kenny Britt) were all selected in the first 33 picks of the draft, and tight end Jared Cook is one of the highest-paid players at his position. Running back Zac Stacy began last year on the bench, but the rookie rushed for 969 yards in the final 12 games of the year, the seventh-most in the NFL over that stretch. St. Louis also drafted Tre Mason in May, the Southeastern Conference leader in yards from scrimmage and touchdowns in 2013. And then last weekend quarterback Sam Bradford tore his ACL. Since 2007, St. Louis ranks last in both passing touchdowns and net yards per pass attempt. The team has been only marginally better since Bradford arrived, ranking third from the bottom in both categories since 2010. Now, without Bradford, its offense could sputter just as it was supposed to be ascending. Over the course of his career, Bradford’s backup, Shaun Hill, has been the definition of an average passer, which is enough to make him one of the better backup quarterbacks of all time. Hill’s career efficiency numbers are more impressive than Bradford’s, but it’s hard to get excited about a 34-year-old quarterback who has thrown just 16 passes over the last three seasons and who is set to take snaps in the league’s toughest division. But Hill is a good fit for the Rams offense because, like Bradford, he is more likely to stretch the field horizontally than vertically. Among quarterbacks to enter the league since 2005, Hill and Bradford have the fourth- and third-lowest yards per completion averages among quarterbacks with at least 900 pass attempts.4 The Rams won’t need to modify their offensive plans with Hill in the huddle, but that says all you need to know about Bradford’s career. By looking at players with at least 600 carries, we’re excluding part-time players of lower quality; by capping the number of carries at 800, we’re keeping the heavy-workload players out of this sample. Since that provides a nice band around the average 4.3 yards per carry produced by the players comparable to Lynch during their three-year runs. Excluding the four players who missed all of the following season. Hill has averaged 10.8 yards per completion for his career, while Bradford has averaged 10.7. Only Trent Edwards (10.7) and Christian Ponder (10.6) have lower average gains.